When I was growing up I had two Italian Aunt Anns. One was my Dad’s little sister; she lived in upstate New York with her kids and my Uncle Vince, and she sent beautiful presents for my birthday, like a pair of jade earrings I rarely wore but still cherish. She is still alive, and going strong, approaching her late 80’s. She winters in Florida every year. The other “Aunt” Ann, was out west in Sacramento where we lived. We weren’t blood relatives, but my Uncle Danny’s family had grown up around the block from my Dad’s in Utica, so finding each other in Sacramento was like a family reunion. We always referred to them as Aunt and Uncle and their two girls as our cousins. In fact their oldest was also named Maria. When we were altogether our names suddenly became “Maria Theresa” and “Maria Judith” so that Moms could yell accurately to the right Maria. So when I was perusing the reads from Weekend Reading a few weeks ago, I couldn’t help but click on this piece in Food 52 about YouTube sensation Clara Cannuccuiari. The last years of her life (in her 90s!) her grandson Christopher convinced her to allow him to film her in her own kitchen making her recipes and telling stories of her life during the depression. The pasta with peas recipe here is inspired by the video embedded in the article, although I couldn’t stop there. I pond hopped from video to video in the course of 48 hours or so until I’d watched every single one. But I came back to pasta with peas, which I wanted to see if I could adapt to be salt and oil free. Right off the bat I’m going to tell you that any Italian Auntie or Grandma would think me insane for leaving these key ingredients in simple Italian cooking out. I wondered myself how I could get the same consistency and comparable flavor without them–and using gluten free pasta to boot–but I decided it was worth a try. I followed Clara’s instructions, with a few key innovations that wouldn’t have been accessible in her depression era home, like using frozen instead of canned peas. I love to keep them bright green so I added them at the last minute, once the whole thing was off the heat. Instead of the oil, I sauteed the onion and potato in a little sore boughtsalt free veggie broth, added after tossing the onion around a bit in the warm pot. I used green onions the first time because that was all I had, and I liked it so much that I used them again the next time in combination with a little bit of yellow onion. I halved the recipe in the video, I’d say, by eye-balling–one unpeeled yellow potato that was half the size of the peeled russet she used in the video, and half a package of brown rice pasta. I added fennel and Utica red pepper flakes to the onion and potato and instead of water to cook the pasta in, I used about 3-4 cups of leftover cooking water from boiling yellow and sweet potatoes and broccoli which had been seasoned with cumin and garlic powder. I threw a whole crushed garlic clove in with the pasta. (I was inspired by how Clara had done this in her tomato sauce recipe–her mother’s “secret,” she claimed, was the whole garlic clove. I kept the heat on the burner until the brown rice pasta was cooked, and then I took it off the heat, added the peas, and covered it for a few minutes. The result was amazing. I was surprised at how flavorful it was. Like Clara, who thought it needed “a little something”–one of my favorite scenes in the video–which she remedies by adding a little prepared pasta sauce–I had prepared to add a little tomato sauce and some leftover mashed up winter squash to the bowl I dumped my serving of pasta in. This was a nice addition but honestly, it was completely delicious without it–the kind of delicious that made my eyes widen in surprise when I tasted a “plain” spoonful of it out of the pot. Since Clara recommends romano grated cheese as a topping, I decided to get a little silly and creative with a vegan grated topping of my own. I treated myself to a tiny bit of grated cashew instead, a lovely touch I learned from Straight Up Food. 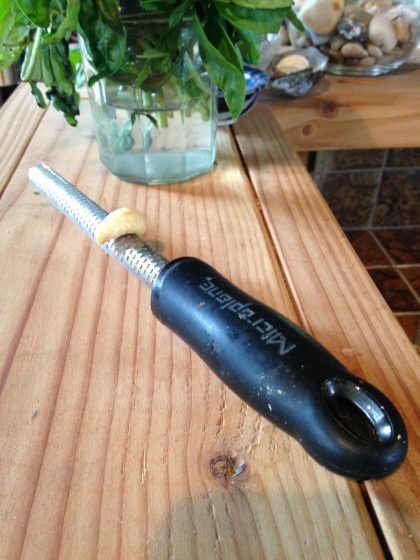 I don’t have a rotary grater, but I do happen to have a nutmeg grater–and I discovered the round shape of the cashew fits snugly over the rounded shape of the nutmeg grater–and so I can grate just one cashew over my serving of pasta which adds a touch of no oil richness. 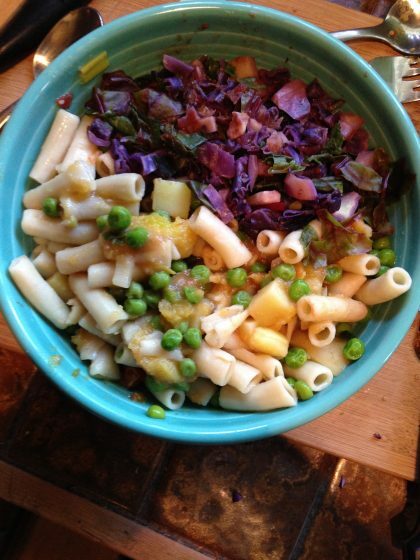 I paired my pasta and peas with some red cabbage and purple tree collards cooked in broth and garlic. It was an ambrosial lunch I’m already looking forward to. Like Clara, I did not measure. I eyeballed what I thought half of what she made might look like. I also fretted that the brown rice pasta would not behave as the wheat pasta in the video did, but as long as I kept the heat on until it softened, I was absolutely amazed at how it soaked up the broth and did not sit in a soupy mixture, something I was worried would happen. It looked like it may not do that when I took it off the heat, added the peas, and put the lid on the pot for a few minutes, but when I lifted the lid it was all coated with a nice thick liquid. Clara’s charm and no-nonsense directness brought me back to every Italian Aunt or cousin or grandma I’ve watched and learned from. It was so comforting and delightful to listen to her stories and in them hear the echo of my own relatives, and to laugh with her when she gets stuck on the word “picturesque”–and then again when she makes the pronouncement that Italians don’t bake, they COOK–although, in another video, she proceeds to make these incredibly labor intensive Sicilian fig cookies for the holidays, which I believe may be a prototype for Susan’s fat free and vegan version Skinny Figgy Bars. If you haven’t already, give Clara’s videos a watch. She left us a wonderful legacy not only of her family, but of all families. As I marveled at how in the world she can dice up an onion without putting it on the cutting board, with hand motions that put me in mind of how my own Italian father, may he rest in peace, sat at the table patiently cutting up fruit into a bowl in the very same manner, I was also profoundly moved to hear her say in another video that the reason she was so good at that (by this time she was answering questions from an adoring audience) is that they did not have things like cutting boards in their kitchen when she was growing up. My parents, too, now gone, grew up during the depression, though they were a bit younger than Clara. In these uncertain times, it was comforting to watch every bit of footage of her careful and familiar movements around the kitchen along with the familiar Italian American cadence of her voice, spiced with her memories about getting through hard times and living a long, dedicated, and loving life. Besides like being wrapped in a warm blanket away from the crazy news cycle, it reminded me that many many people, both in this country and the world over, have lived through hard times, and made it work. They thrived even. They overcame. And that gives me hope that we will too, with lessons and inspiration from the past. I stand with a long line of people who loved justice and fought for fairness and equal rights. I lengthen that arc. And to keep me going in that direction, I make a bowl of pasta and peas, in honor of Clara’s life, my family’s lives, and the lives of those who struggled to make ends meet and be seen as worthy human beings when they came or were brought to this country, and I know it’s good food for the current lap of that same journey. Thank you, Clara. You live on in the hearts of so very many. And so do your recipes. I’m so delighted by this post, which is the perfect tribute to Clara. I’ve been as touched by her videos as you have, and like you, I’ve found that they evoked what it’s like to watch a home cook who knows what she’s doing and is able to do it with fun, improvisation, and intuition (I’m thinking of my best friend’s grandmother and my own Yaya to some extent). Love your modifications to the dish, and I’ll need to try the broth trick with pasta at some point. Your post illustrates perfectly the fact that it’s possible to change the ingredients or process of a dish without taking away from its essential character—indeed, while preserving that character perfectly. Thanks for sharing! I love everything about this, from the finished dish right down to the fact that the cashew fits around the nutmeg grater! Now I’m looking forward to watching the videos. Sounds like comfort food for the soul. I always have loved Clara;s videos. So I made this dish today much the same as you did, but added mixed frozen veg. When it was done I finished it off with a little cheez sauce (made with all kind of good things and cashews). Very simple, very filling. I love watching Clara’s knife skills. My mom did the same, cut into her hand. A lot of mom;s had this skill and never cut themselves. Hi Deb! That sounds like a delicious version as well! And yes, isn’t it lovely to see those knife skills and see our parents hands again through her hands? That is priceless. That grandson knew what he was doing as a film maker, bless his heart. Thank Ellie, you are amazing! I love that you are making “Stoup” that works for you and eating so healthy to help your conditions. I also love how this corresponds with the kind of food your Croatian Baba made for you. <3 I just absolutely teared up at all your good thoughts and memories of Joe and my parents, too. Blessings to Lori on her path as well. Love you!